The natural regional Park of Montagne de Reims offers a diversity of landscapes enabling for the development of amazing flora, diverse and abundant. Forests, valleys with chalky hills, rivers, ponds, moors and pastures are many natural habitats that brim with rare and unique species. From the north to the south and from the east to the west, sources, ponds, pools, rivers and streams mark the landscapes of the Park. The south of the Park is crossed by the river Marne. From its source, at the foot of the plateau of Langres in Haute-Marne, it crosses five counties including the Marne County where it encounters the territory of Montagne de Reims, its vineyard, its forest and its many rivers. At the heart of the Park, the forest massif is full of ponds and wet areas. 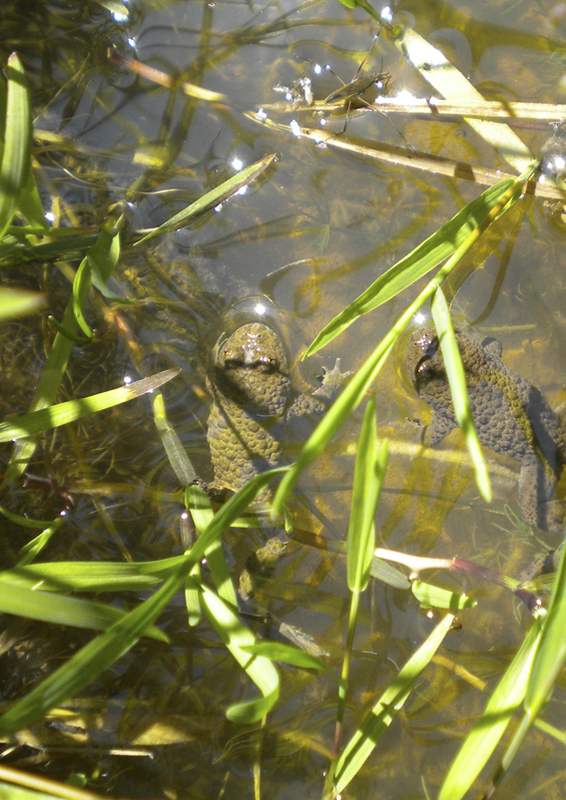 Some soil caving, the war bombings and the extractions of materials paved the way for such unique habitats which are a paradise for yellow-bellied toads (Bombina variegata). The latter look for stagnant water located in meadows, pastures and forests. Thanks to their biological richness, their rarity and the fragility of the species that they host, « Pâtis (pastures) of Damery » are listed as a Natura 2000 site. 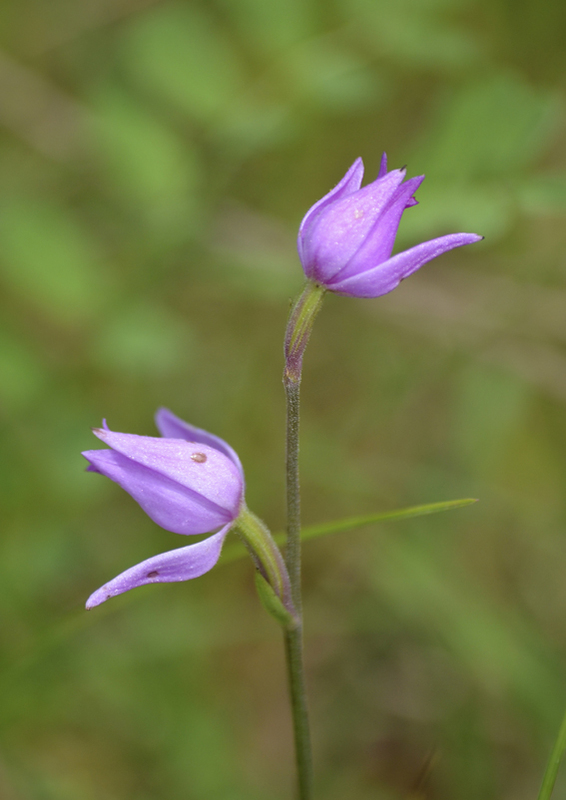 Woods, moors and ponds shape the identity of these former pastures for sheep that hold a strange and exceptional nature such as the red Helleborine (Cephalanthera rubra), a rare orchid. The Montagne de Reims has not always been like we know it today. Glacial or tropical, underwater or dried up, the Montagne de Reims has been one and the other along the centuries. This mountain, 70 million years old, is a real geological treasure made of chalk, sand, clays and limestone. The soil of Montagne de Reims is made up of several mineral layers that have gradually been laid down over the centuries. 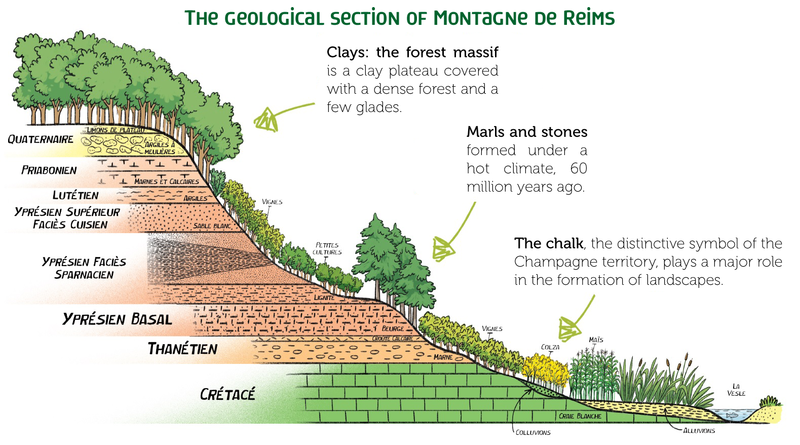 The diversity of these minerals has shaped the landscapes building up the Montagne de Reims over time, a patchwork of agricultural plains, of forests bordered by slopes onto which a unique vineyard is planted. Laid down 70 to 80 million years ago, chalk composes the first mineral of the Montagne de Reims. Chalk allows for a large water reserve. With the industrial revolution, chalky Champagne has become one of the most productive agricultural plains. The chalky soil also plays a leading role in the production of Champagne wines where vines are mostly planted. The high porosity of chalk enables to regulate the water that vines draw in necessary quantity for them to grow. Covered by the sea for a long time, a limestone rich in fossils (oysters and marine species) laid down here in the Montagne de Reims. So, it is quite usual to meet some fossils of urchins, belemnites, sponges ... that used to live in these salted waters. 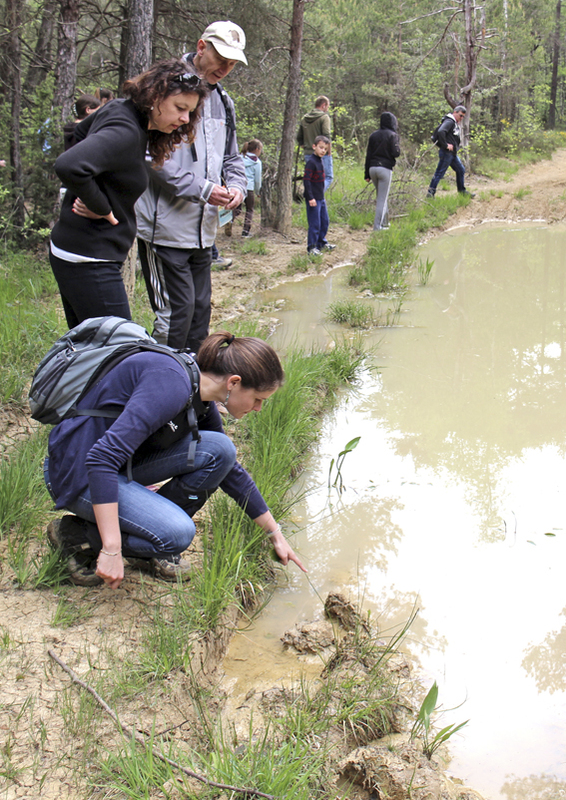 True paradise for amateur geologists, the Montagne de Reims abounds with many treasures. Embark on the discovery path of Mailly-Champagne to discover a sparkling heritage by nature! The forest massif of the Montagne de Reims covers nearly 40 % of the Park territory. It is composed of private, communal and state forests. Beeches, oaks, alders, or ashes compose this massif sheltering rare, even unique flora and fauna. 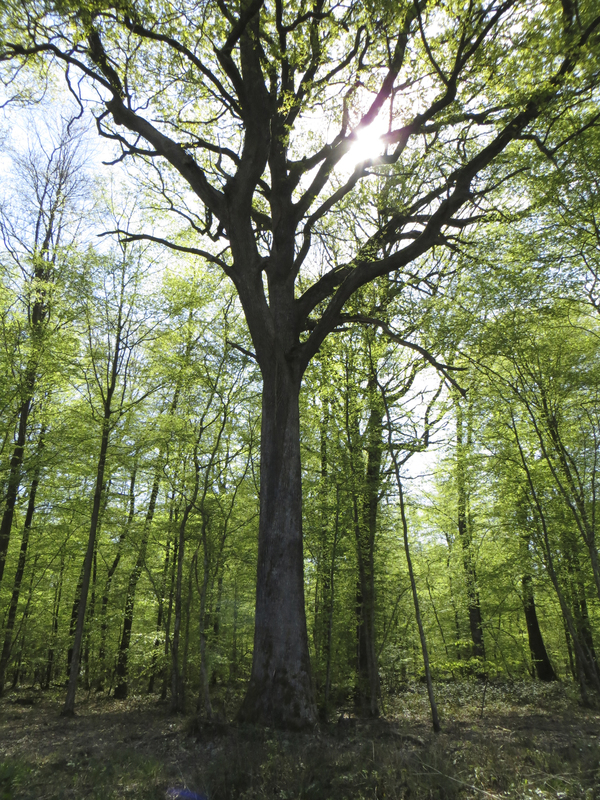 Full of legends and mysteries, the forest makes the delight of nature lovers. Let this exceptional green oasis and the diversity of its massifs labelled Forêt d'exception®. The forest of Verzy spreads on 1.032ha at the east of the Park. With its rich biodiversity, it shelters many ponds and wet areas inhabited by a large population of amphibians (salamander, crested newt...), together with caves and underground cavities appreciated by bats. Located within the Park on a plateau looking over the slopes of Champagne, the state forest du Chêne à la Vierge spreads over 2.046ha. 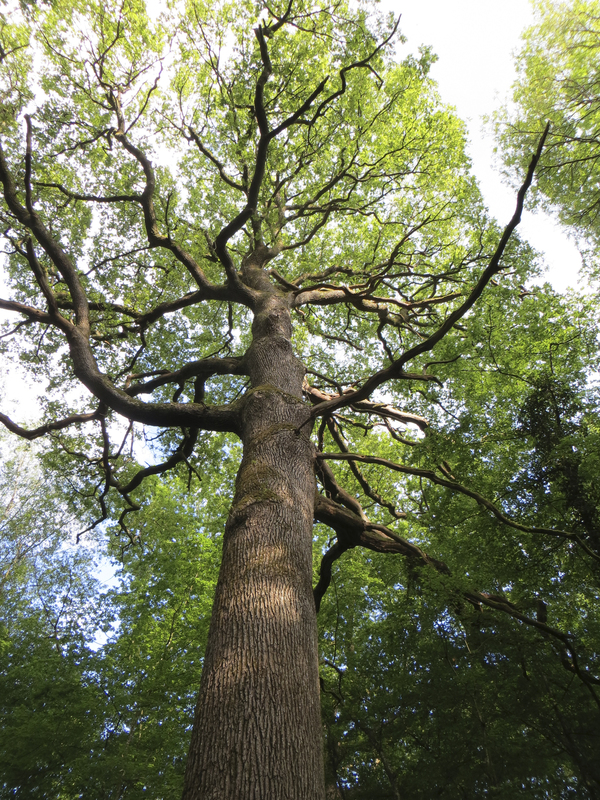 It shelters unique plant species, in particular its remarkable trees identified in 2015. Impressive by their dimensions, revealing a past history or calling for imagination, such trees are real ambassadors of their forest. 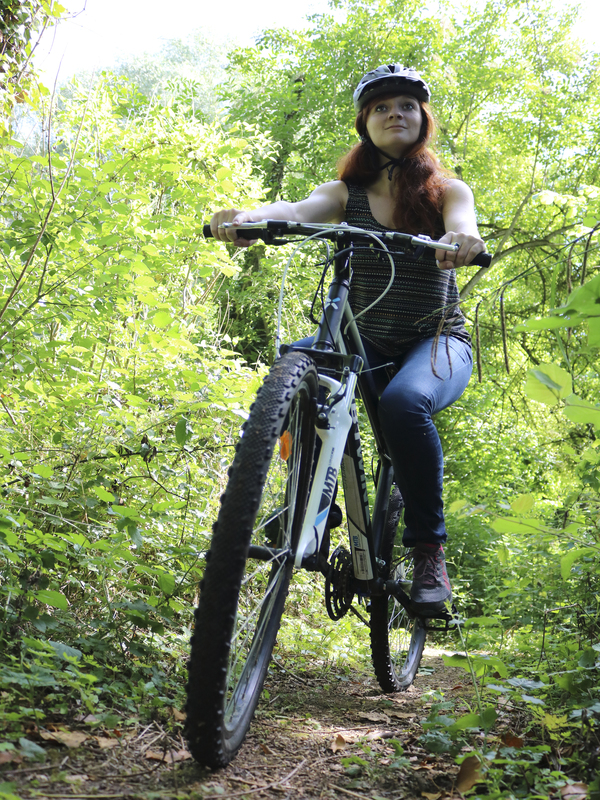 Discover them by walking, by biking or with a mountain bike. Two mountain bike paths are marked out in the western part of the forest, a 10 km-green loop and a 21 km-blue loop (map to be downloaded here). At the South of the Park, the state forest of Hautvillers spreads over 408ha. Mainly composed of sessile Oak (63%) and Beech (21%), it borders the wine-growing slopes of the village of Hautvillers, the historical cradle of champagne. It used to belong to Hautvillers abbey, well-known for welcoming Dom Pérignon, the famous Benedictine monk who developed the champagne wine-making process. As the entire forest massif, the forest of Hautvillers makes up, beside the vineyard, the identity of the Champagne terroir. Indeed, the forest sets the backdrop of the Champagne vineyard landscape, which shows the special interest for this forest and justifies its highlight for its enrolment to Unesco‘s "Slopes, Houses and Cellars of Champagne".